This entry was posted on January 26, 2011 by Alex Martel. 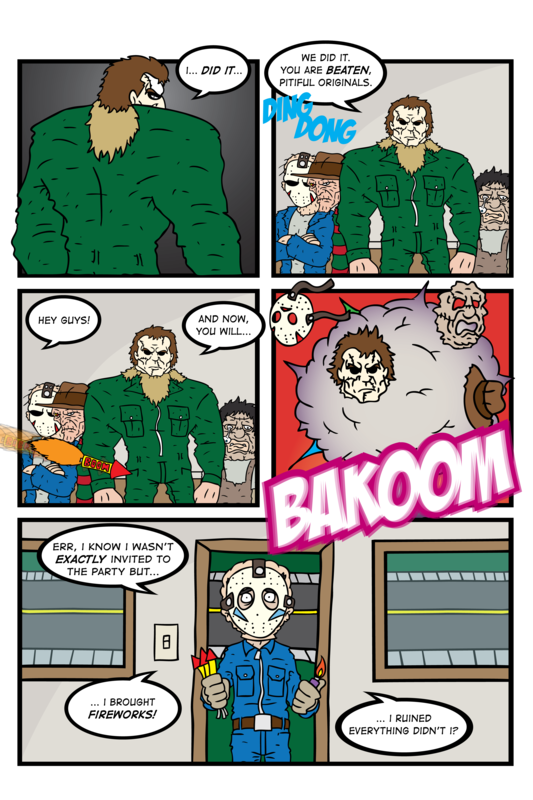 It was filed under Comics, The Slashers and was tagged with burns, evil, fred, freddy, haley, halloween, jackie, jason, jay, krueger, michael, mike, myers, remake, roy, slashers, street, voorhees, zombie. Wait… So if Original Jason has a gray mask (my browser only views images in black and white) and Remake Jason was at the “party”… Then who’s that? I hope Remake Jason is okay… Even though I’ve never seen a horror movie in my life and my moderate Jason obsession has no reason to exist. For a moment, I thought Ash Williams was going to come in and spoil everyone’s fun. Melee is a apin when someone else has a firearm. Only in black and white? Well that’s interesting, which browser do you use? Anyways, the other character is Roy Burns, the Jason copycat from Friday part 5. Nobody loves Roy, and I thought it was funnier if I lured people into believing it was Ash instead. Thanks for the comment! Alex? Are you OK? You haven’t posted anything in months. Are you taking a break? If so, will you inform your readers when you’ll be back? Thanks.